For a long time I have wanted to learn how to can and preserve food. I can’t really explain but it just looks like fun to me. 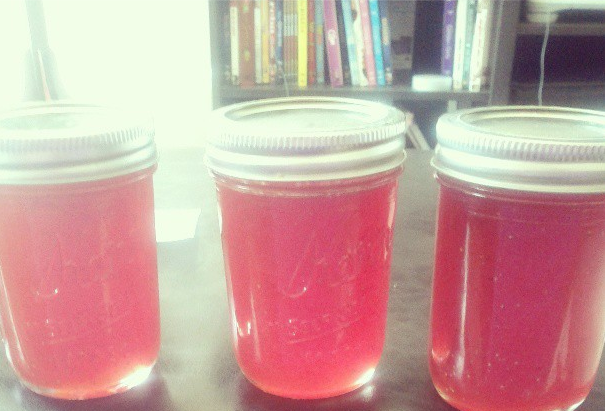 Oddly enough the only thing I have ever canned is strawberry jam. 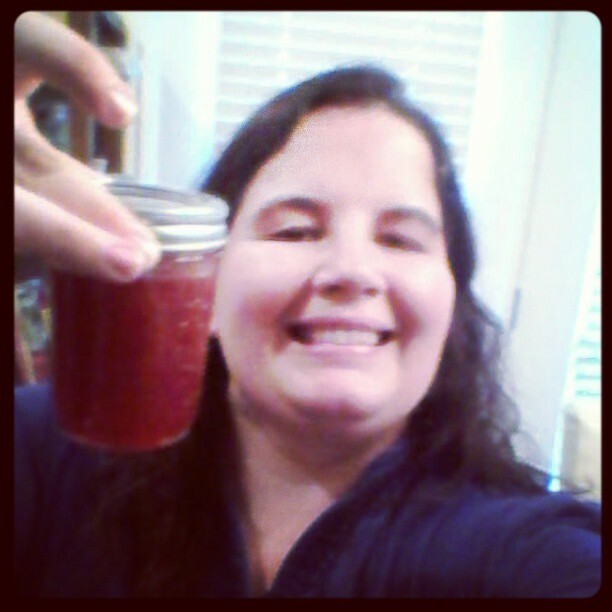 This was years ago before my mission when I made jam using the sweet berries that are sold in California by the Vietnamese and Loation refuges. They are one of the best food items I’ve ever tasted. 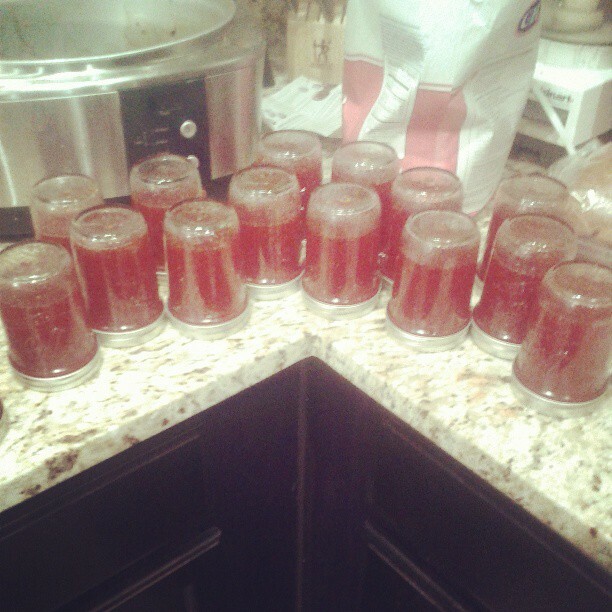 A couple summer’s we would buy more than we could eat so we made strawberry jam. With this memory in my mind when Kate told me they were offering a strawberry add-on where you could get 8 lbs of strawberries, splitting that between the two of us that would make 4 lbs each. 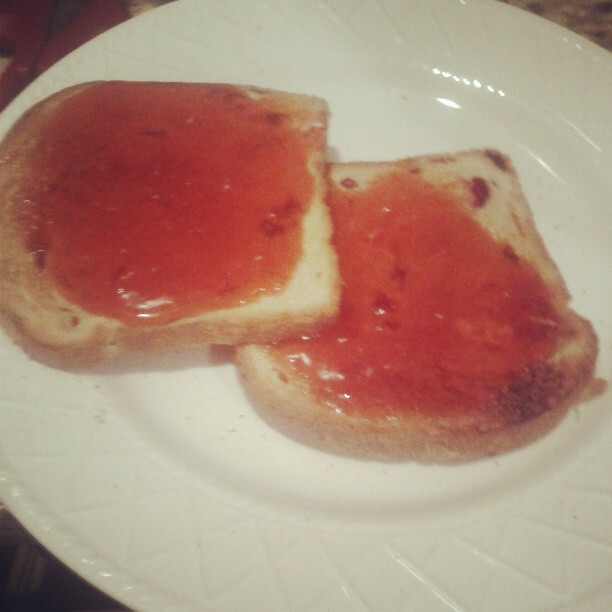 Obviously that would be a lot for me to eat on my own so I decided to make jam. I particularly like homemade strawberry jam over store bought because I don’t really like the big chunks of strawberry that is usually in strawberry jam. I blend it up pretty fine so the resultant jam has more of the consistency of jelly without straining the fruit pulp out. So yesterday I got to work. 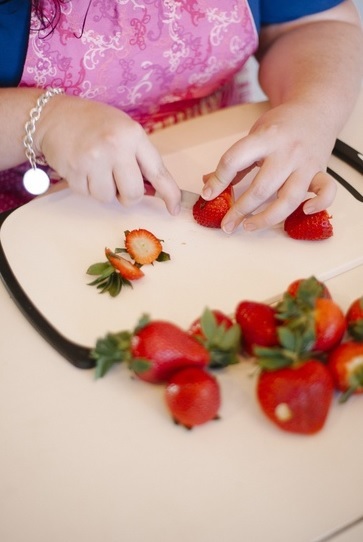 First you have to cut the stems off the strawberries. 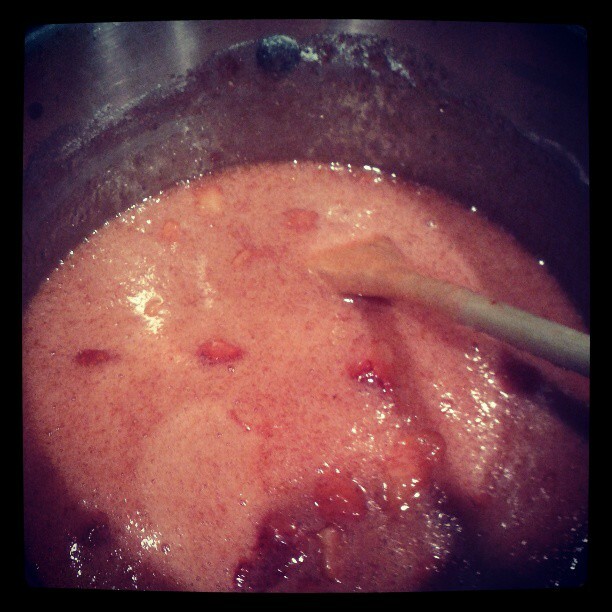 Then you blend the strawberry mixture (or part of the strawberry mixture depending on how chunky you like it). Next add it to a pot and turn on heat. 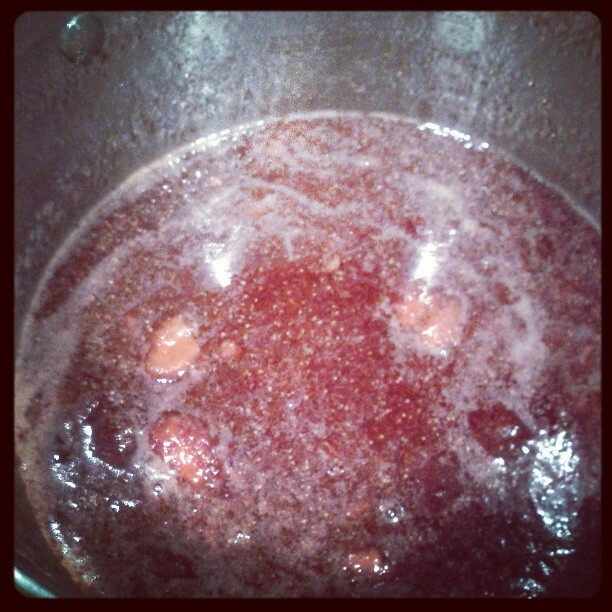 Once it starts to simmer add in sugar. 4 cups for each lb of strawberries used. (It’s a lot but the recipe goes a long way and if you think about it you only use a little in each sitting so don’t worry! You can use sugar free but I am not experienced enough to try that). Add in the gelatin (1 box for each lb of strawberries) and bring to a boil, the juice from 2 lemons and 1/4 cup of butter. Cook at a rolling boil for 3 minutes Skimming off foam as you go. Once the jars are full (leave a centimeter or two for the jam to expand and create a good seal) wipe off the edges and put hot lids on as quickly as you can. Then turn them upside down. This helps create a seal. You do not need to water bath the jars for this recipe. Some won’t seal and the button on the top is popped up. 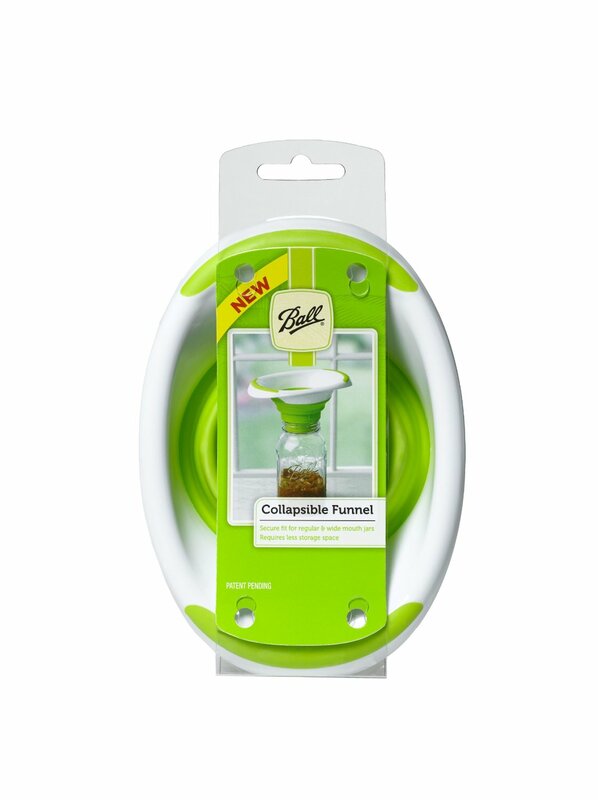 Use those right away or for the freezer. It was fun to do something so domestic and do it well. Today someone told me I looked like a Grecian Goddess! I think I was inspired by my jam success. What do you guys like to can, bottle or preserve? So who wants some! Btw, 3 more comments until I get to 2,000 comments. Lately I’ve gotten really into making jams. I like making them at home because I can blend the fruit more than you see at the store bought. Here’s the recipe for my peach jam https://smilingldsgirl.com/2013/07/28/getting-peachy/ . Enjoy! I can’t wait to make more flavors.